Come to see this picture perfect waterfront home in Avon Heights located in Dania. Attention all boaters! 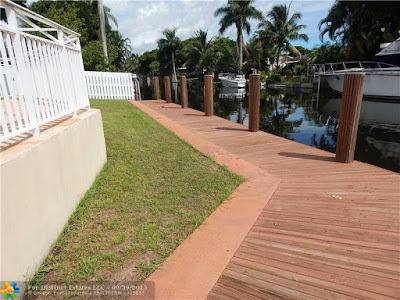 Here is your chance to park your boat directly behind your home for an affordable price. You have easy and quick access to the ocean. The refreshing swimming pool overlooks the sparkling water. The gourmet chef inspired kitchen features stainless steel appliances,solid wood cabinets and granite counter tops. All of the doors and windows are high impact glass. The roof was recently replaced. The home features a new water heater and air condition. This three bedroom two bathroom stunner is spaced out on over one thousand five hundred feet of perfectly appointed living space. All of the main living areas are tiled through out. The home features a separate laundry room too! The bathrooms have been remodeled. Residents of Avon Heights are in close proximity to world class dining, shopping, and entertainment at nearby downtown Los Olas, Fort Lauderdale and The Galleria shopping center. The Fort Lauderdale International airport is a very short drive. The world renown beaches of South Florida are also just a short drive from this jewel.